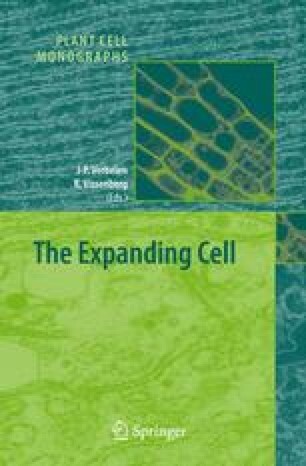 The cytoskeleton governs many critical processes in expanding plant cells, including the delivery of wall components and the establishment and maintenance of growth direction. This work describes how cytoskeletal arrays assemble, and how their spatial organization and dynamics regulate the anisotropic properties of plant cell walls. We describe the mechanisms that construct and organize transverse microtubule arrays, and explore how these arrays, and the direction of elongation, are influenced by hormones. We then consider how cortical microtubules regulate the mechanical properties of the load-bearing cellulose microfibrils, through interacting with cellulose synthase complexes, and by coordinating the secretion of wall proteins. Actin microfilaments form part of the machinery that controls polar auxin transport, and have critical functions in vesicle transport. In recent years, it has become increasingly clear that microtubules and actin microfilaments work in concert to coordinate cell expansion. This microfilament-microtubule coordination is mediated through the activity of Rop GTPase signalling switches. We highlight this process in the growth of pavement cells found in the epidermal layers of leaves. We thank members of our laboratories and collaborators for stimulating ideas. Research in Geoffrey Wasteneys' laboratory is supported by a Natural Sciences and Engineering Research Council (Canada) Discovery grant. David Collings acknowledges the support of an Australian Research Council Research Fellowship and Discovery Grant DP0208806.